So recently in the podcast I gave a list of things that I would be doing different in the future when recording or putting an album together. Well, I have been following my own advice. Now though it was respective to things I needed to improve, the advice itself was not solely mine. I have been learning a lot lately and have already put into place several things that are helping, things that I would've overlooked or thought not to be important had someone else not taught me the importance. 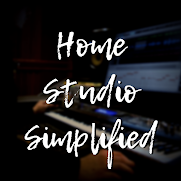 So today I share a short list with you of things that are important when it comes to recording, mixing, or just plain studio related work. Already these few simple steps are improving my latest recording, I will be sharing some other things here soon on the YouTube channel. Stay tuned, subscribe, and share!